PURINA Veterinary Diets are scientifically researched foods that have been developed by nutritionists and vets to provide all that your cat needs to maintain health and growth. 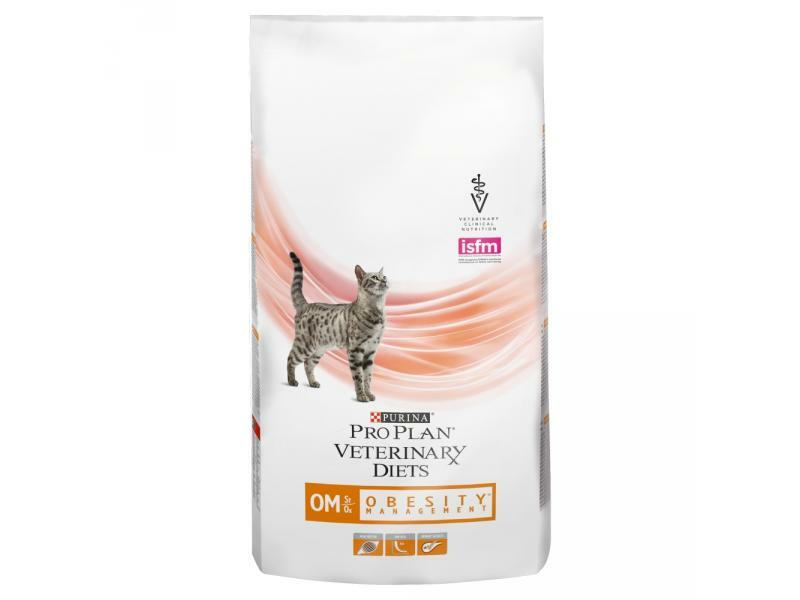 PURINA Veterinary Diets OM Formula is a diet which has been clinically proven to be effective at weight loss in obese cats. It's low fat, high protein content means it can also be used as a maintenance diet and is effective at keeping the cat's muscle mass at an optimum size. Maize gluten meal, wheat gluten meal, soya meal, dehydrated poultry protein, wheat flour, pea fiber, digest, minerals, animal fat, fish oil, yeast. Meat and animal derivatives, minerals, cereals, derivatives of vegetable origin, various sugars. 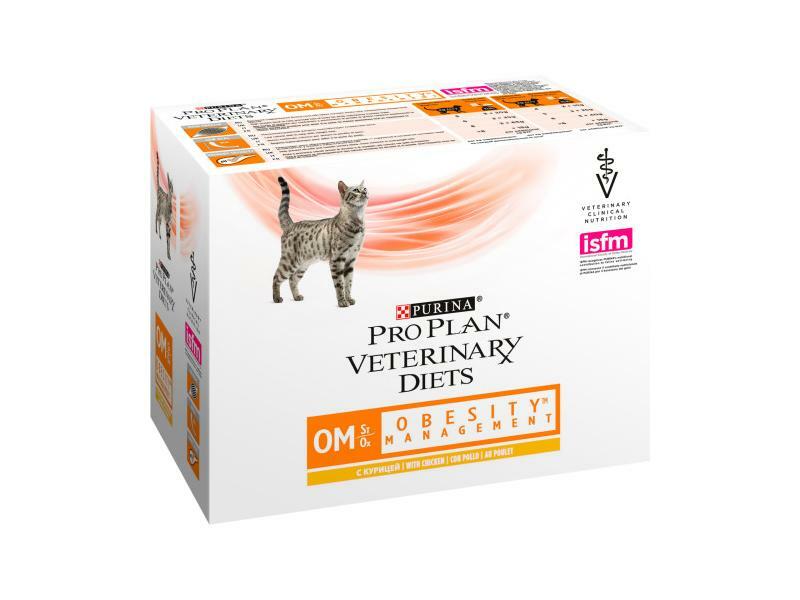 Below are some recent questions we've received regarding Purina Pro Plan Veterinary Diets Feline OM Obesity Management, including answers from our team. How much to feed my cat? I visited my local vet today with my cat for his yearly booster. They weighed him and he was 8.5kilos. He is an indoor cat so doesn't get much exercise. I feed him on Royal Canin light weight care which is lower in calories. All the vet said was to reduce his food. I feed him 40g twice a day. What I would like to know is how much do I reduce his food to? Is the food I'm giving him ok? Is the Purina Veterinary diet OM Obesity Management any better? I am really concerned about his well being and don't want him to end up with diabetes. It sounds as if he is dramatically obese to me. Some foods are less fattening than others, but given the situation you are now in, the only way he will lose weight is to restrict the amount of food he gets, just as your vet has said. The amount you should give is easy to work out for yourself in time. You have to start off by knowing how much he actually eats in a day, then I would offer 10% less than that for 2 weeks and see how things are going. You should feed him twice a day and he should be eating all that you put in the bowl very quickly. If he wanders off and wants to come back later to finish any, you are giving him too much and you should reduce it further. If he is eating it all up very quickly and having to wait until the next meal, then he will be difficult to live with because he will demand more food, but there is a chance he will lose weight. If he is hungry at this level of feeding, you continue for 2 weeks and go back to the vets to get him weighed (often a nurse will do this economically). If he is losing weight then continue with this amount of food, if not then you have to reduce by another 10% and try that for 2 weeks. So you go on. The correct amount of food to give him is that amount which produces the correct body weight. There is no greater truth than that and there really is no mystery to it. If he is too fat, you should gradually reduce it. Rapid weight loss is actually dangerous to a cat, but gradual weight loss would be good for him. If he is overweight he has been getting too much and you need to reduce it. Trial and error will eventually get you to the point where his weight is just right and then you know how much to feed him. If he ever gets too thin while remaining hungry, you need to increase the amount of food. If he is thin and not hungry he needs to see a vet. Otherwise just aim for very gradual weight loss over many months, slowly restricting the amount of food he gets. If you only feed him twice per day at a regular time he will get used to the routine and not pester for food all the time.